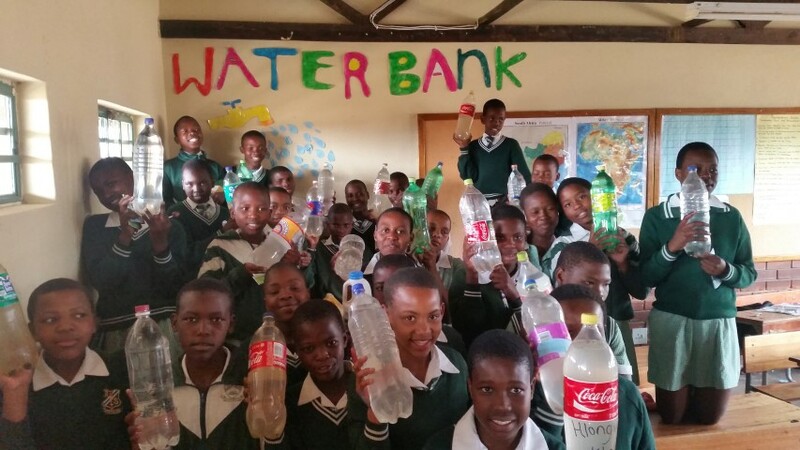 Inspired by the Birches Pre-Primary School Water Bank idea, Phumelelani have now decided to start their own grey water bank. Understanding the present day water scarcity at the schools ( the borehole is at an all time low) Grade 7 pupils are encouraged to bring as many 2 litre bottles of grey washing water to school as possible. This grey water is used to water the parched soils instead of using clean water to do the same job. Plus, in a recent Permacultural workshop, Sebe Mbele ( the environmental co-ordinator) learnt that applying soapy water to diseased plants suffering from aphid infestation can help to reduce disease. Not only are the are the Phumelelani Grade 7 class committed to rescuing their fresh water, as an added incentive, each pupil will receive one paper drop to add to the wall every time they bring a bottle of grey water. Next term, the child who has earned the most drops will win a prize. All the children were hugely motivated by this creative and fun idea to save water and already taxi drivers are having to ration the number of grey water 2 litre bottles being brought to school!! Thanks to all the devoted teachers that are driven to make the best of this challenge.